What a strange followup to Room for Lenny Abrahamson, with Frank really being the only other feature of note that he’s directed. Thinking of it that way, it’s no so odd that an acclaimed director should stumble, since he’s really only acclaimed for one project and he’s only ever done three total Hollywood movies in the first place. It shouldn’t be shocking that his latest film is no good, simply because his big hit might have been a fluke. And he might be a talented artist who just made a mistake, the jury’s still out, but what have you done for me lately, Lenny. 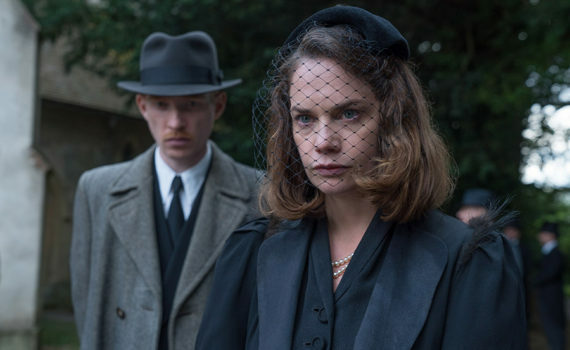 Regardless, The Little Stranger will leave a bad taste in the mouths of audiences and will make them second guess their next spoonful. Hundreds Hall in England has seen better days, and the old Downton Abbey ways have become pages of the past, not a way to live in modern times. The Ayers family has lost their money, they are selling pieces of their land, Roderick Ayers is a wounded war veteran, and the house itself has a creepy feel that keeps the neighbors away. The family clings on because of their memories, including a sister who died there, but no one else would want the place, until a local doctor with a tie to the mansion comes calling to mend an illness. Mr. Faraday was once enamored with the old Ayers place, imagined himself as a rich young boy, and now that he’s in the Hall, he finds himself oddly drawn to it. He’s also drawn to Ms. Caroline Ayers, who needs someone to protect her from the spirit of the place itself, which is writhing in discomfort and reaching out to touch the lives of the unlucky few who still live there. It’s unfortunate that this film is so badly directed that you can point to specific times when doing the opposite would have been what any sane filmmaker would have done, because Abrahamson is someone who I want to like, for Room and for Frank, but who I can’t support if this is what he’s going to pump out now. The pace was clunky, the transitions were sloppy, the timing was off, and the story wasn’t creepy enough to scare, wasn’t dramatic enough to compel. It fell in the middle of many genres, and wasn’t good enough to be claimed by any. Gleeson is talented, but he’s done much better. Wilson was awful, and I’m sad to see her take that turn. Will Poulter was the worse casting decision of the millennium and Charlotte Rampling was completely wasted, so the supporting cast didn’t do its job, not at all. The “twist” is dumb, the plot is thin, the period is badly represented, and there’s really no compelling reason to watch this movie.